This was the first Task Force operation closely coordinated with United States ground forces. Over-all co-ordination was exercised by Task Force Headquarters. PORTSEA was primarily a Search and Destroy Operation in the area between Nui Dat and Xuyen Moc to the East, and from Binh Gia southward to the sea. During the first phase 21st to 30th March, the Battalion conducted operations South of Route 23 between Route 44 and the Song Rai in conjunction with similar operations North of Route 23 by the Ilth (US) Armoured Cavalry Regiment. The second phase, 31st March to 16th April, was mainly the protection of United States and Australian Engineers who were repairing and re-opening Route 23 from Dat Do to Xuyen Moc. Concurrently Search and Destroy operations were being conducted by a brigade of the 9th US Infantry Division, generally in the Operation INGHAM area and further towards the East and North. 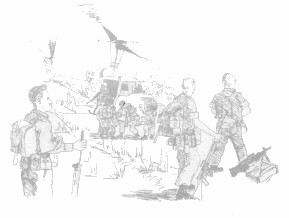 B Company initiated Phase 1 by moving South, mounted in APCs of 2 Troop, A Squadron, to search the coastal area north-west of the fishing village of Lang Phuoc Hai. 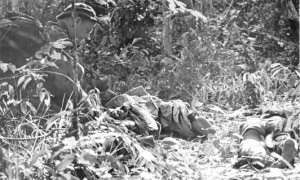 En route a report was received of a large VC attack on the Vietnamese Popular Forces Post at Ap Lo Gom. This attack had begun in the early hours of the morning, but by the time B Company received this information the VC had broken off the attack with heavy losses. B Company crossed Route 44 and moved north-east along the coastal strip. About mid-morning contact was made with Sth VC Division Reconnaissance elements who were occupying a skilfully concealed dugin position. B Company suffered three wounded, two of whom subsequently died in hospital. The enemy abandoned the position and withdrew to the north-east. Throughout the remainder of the day the coastal area eastwards to the Song Rai was searched without further incident. During the night the Company ambushed the entrance to the Song Rai and just after first light the next day sank three motorised sampans which had approached the beach to the West. It had been originally planned for the Battalion to be inserted by air mobile assault on the 22nd March in the northern part of the area of operations, and, in conjunction with B Company. to conduct Phase 1. However. because of the attack on Lo Gom and intelligence which indicated that this attack had been made by 2nd Battalion 275th VC Regiment, and that the unit might still be in the area to the East of Lo Gom, it was decided to air-land the Battalion near the Song Rai and to establish a blocking position along the East bank of this river to prevent the 2nd Battalion's withdrawal. Accordingly the Battalion landed at about 9 a.m. and deployed to the South. 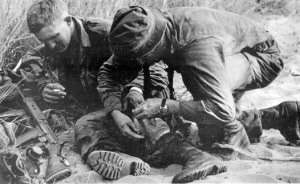 During this movement, C Company had a minor contact with a small group of VC. 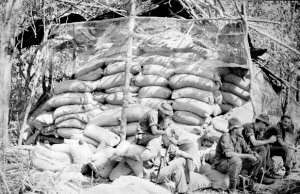 At about mid-afternoon a heavy contact was made by 2 Platoon A Company with a well dug-in enemy force. After the initial contact the position was engaged with 105mm and 155mm guns and a section of 5 RAR mortars who were under command. In return the enemy engaged A Company with 6Omm mortar fire which wounded one soldier and a PR officer attached to the Company. In the meantime A Company had reorganised and prepared to assault the enemy position. The assault began at about half-past four and the position was taken and secured 15 minutes later without further casualties. For the next three days the remainder of the area was searched. Camps and installations were found and destroyed, but no further contact was made except with a small group of VC on 25th March by A Company of the 5th Battalion which had been placed under command. On 26th March the Battalion's area of operations was shifted to the East of the Song Rai. The major incident in this period was the discovery of two large caches of bagged unpolished rice by C Company; 622' tons of rice was backloaded, but C Company sustained three wounded from booby traps located in the caches. On 28th March the Battalion virtually ceased active operations for the remainder of Operation PORTSEA. 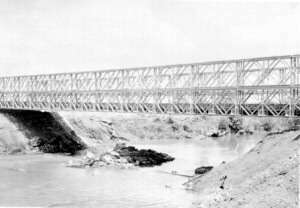 Until 4th April the main task was to protect the US and Australian Engineers engaged on repairing Route 23 and constructing two bridges, including one over the Song Rai. Local patrolling was carried out but with little result. On 4th April a soldier of A Company was killed when he trod on a mine on Route 23 as he was returning to the Fire Base from an all-night ambush. Phase 2 of PORTSEA began on 5th April. It involved the Battalion clearing and securing Route 23 from the Song Rai to Xuyen Moe to allow the Engineers to move to the area of Xuyen Moc to construct an air strip and to complete their work on Route 23. The major effort of the Battalion was given to protecting the Engineers and local patrolling, with generally inconclusive results. D Company remained to protect the bridge over the Song Rai. This phase finished on 14th Aprfl when the Engineers had completed their task and returned to the Horseshoe. The Battalion escorted them back to the Song Rai. For the next three days the western area of PORTSEA Phase 1 was researched with little result. Operation PORTSEA finished on 16th April. when the Battalion returned to Nui Dat. 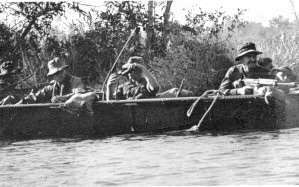 An interesting feature of this operation was the use of assault boats by the Assault Pioneer Platoon to search the Song Rai. This experiment was successful and enabled the pioneers to locate otherwise difficultto-detect VC riverside camps and sampans, as well as to practise their watermanship. 250,000 Ibs. of rice - 40 gallons cooking oil 4,000 Ibs. salt.